What Can You Do about a Senior Who Wants to Be Controlling? ← Can Home Care Help Your Senior Do What She Loves Again? Home Care Services Oakland TN – What Can You Do about a Senior Who Wants to Be Controlling? Some aging adults find that as they start to feel as if they’re losing control, they become more controlling with the people around them. That might mean that you start to feel the brunt of that behavior. It’s entirely possible that some of your senior’s controlling behaviors are related to her health. This is especially true if domineering tendencies are a new thing for her. Talk with her doctor and learn as much as you possibly can about what is going on with your aging adult. Sit down with your elderly family member and have an open and honest conversation about how this makes you feel. Let her know that when she’s trying to micromanage what you do, it undermines you and complicates the situation for you. It’s very possible that your senior doesn’t realize how her actions and her words affect you and seeing things from your perspective inspires her to make a change. The thing about establishing boundaries with your aging adult is that you have to keep enforcing them with her. If you don’t speak up when she crosses your boundary again, that lets her know on a subconscious level that it’s okay to do that. You have to lovingly remind her when something happens again that it affects you in a negative way. There are some areas in your senior’s life where you are not going to agree with each other. At some point, you may have to let that go. 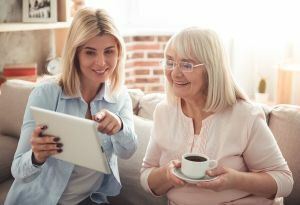 Delegating those situations to other people who don’t have the same issue with your senior can make a big difference both for you and for her. Home care services providers are perfect helpers in this situation because they can handle every aspect of what your senior needs. You’re going to need to take more breaks from caregiving, too. Having the help of home care services providers is actually going to facilitate this for you. Take advantage of their presence and leave for a while. It will be easier for you to cope when you have some time away. This is not an easy way for you and your family member to embark on a caregiving journey together. But while you can’t change her behaviors and reactions, you can do something about your own. Do what you can and let go of the rest.